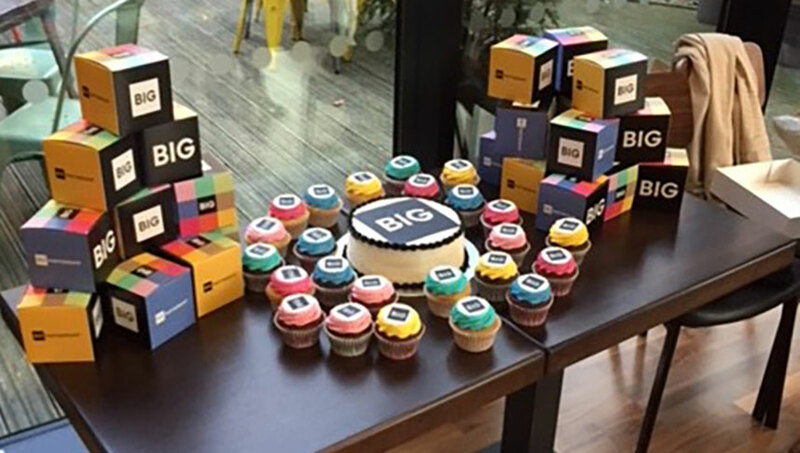 It’s hard to believe that it’s been a year since we joined the Northern Powerhouse and the worker bees of Manchester at our King Street base; but here we are – looking back on a suitably BIG birthday bash featuring, amongst other things, Lancashire hot pot and giant Jenga. We couldn’t have picked a better venue and everyone was made to feel at home, at HOME. We picked it because we couldn’t think of a more fitting venue for the occasion; a symbol of regeneration and Mancunian culture in the heart of the city. It didn’t disappoint. However, let’s get started with the most important part of any birthday party, cake. As you can see, we were suitably stocked with delicious treats lit up with our BIG Partnership new fresh look thanks to brilliants bakers, Jelly Tots and Dolly Mixture, based in Sale. Those without a sweet tooth need not despair though, between Lancashire hot pot, fish and chips, Thai green curry, salmon canapes and mini grilled cheese sandwiches we all left feeling like we’d taken a culinary world tour. Things did get competitive throughout the evening, however, as our guests were invited to get their classic-game-faces on with Connect 4, Jenga and Kerplunk. Forget about the table top games you played as a kid, these were BIG grown-up versions and went down as well as the canapes. The evening gave the Manchester team the chance to reflect on what has been a superb year for us. We’ve grown client numbers and accounts, we’ve grown the team with a number of new signings and we’re about to grow the square footage of our Manchester home with another office upgrade. If not for the fact we’ve welcomed two new recruits in the past three months, we need to make room for the BIG new wall branding waiting to be displayed. The next year has got us all excited on many different fronts. We’re actively growing BIG Partnership’s footprint in the North of England; we’re actively playing a part in helping to shape Manchester as an outwardly looking global city, and we’re growing as a group of people who share the same aim – growing our Manchester office to become a powerhouse of its own. Manchester has been very good to us; we’ve been captivated by the city’s culture people and spirit (and yes, we include Manchester Gin in this) and it’s fair to say we’ve fallen in love with it all. We’d like to extend a massive thanks to all our friends and clients across Manchester and beyond for attending and making our BIG birthday bash one to remember. We’ll see you next year for something that’ll get everyone proper buzzin’ all over again.